LAKE BUENA VISTA, Florida -- Austin Riley is trying to be a man of many gloves. The Braves' No. 5 prospect has made 404 starts in the field in the Minor Leagues -- all of them at third base. But as a non-roster invitee to Major League camp this spring, he's working at first base and in the outfield in hopes of carving out a big-league role for himself with the defending National League East champions in 2019. That's a direct result of Atlanta signing three-time All-Star third baseman Josh Donaldson to a one-year, $23 million deal in late November. It may have come as a surprise that a club that thrived on young talent in 2018 would block the game's No. 38 overall prospect coming off a season in which he played 75 games at Triple-A Gwinnett, but the move didn't shock the 21-year-old himself. "[General manager Alex Anthopoulos] actually called me right before to say, 'Hey, we're looking at Donaldson. It's nothing against you. We're looking for a one-year deal,'" Riley said. "It was very honest, very open, and I really appreciate him doing that. It kinda means there's a respect between me and him there. It was basically a 'You might be bouncing around' kind of thing, and that's all good." That's just company policy, according to director of player development Dom Chiti. "We don't keep things from our players," he said. "We're very transparent, very honest and very upfront with them. ... He knows what it is. These kids are young, and they know that their whole careers are still out in front of them." Just before Christmas, Anthopoulous put in another call to Riley with some offseason homework -- baseball's version of summer reading. The organization was hoping the infielder would see if the outfield could be a fit in camp. So he took to the fields back home at a local high school in Mississippi, while his father, Mike, fired up Hack Attack machines to send balls to the corners "about a mile in the air," according to Riley. "Really just getting fly balls, getting reps," he said. "That's the biggest thing. For sure, I played some right field and at times a little left. Taking reps. Seeing fly balls. Seeing trajectory. Working on mechanical footwork stuff." One big reason why the move could work is Riley's arm. A pitcher in high school, his fastball hit the mid-90's at times. That arm strength has translated to the hot corner, making Riley a more than adequate defensive third baseman, and it could also be an asset in right or left field, given time for defensive development. After those initial discussions back in December, however, Riley has yet to play the outfield in the Grapefruit League. He still keeps an outfield glove -- one sent to him as part of a new sponsorship with Mizuno -- handy for the occasion but admits, "It's kinda backed off now. I don't know why. It just has. But we'll go across it whenever we get to that bridge." Instead, the Braves have been more open about getting Riley a chance to play first base, where at 6-foot-3, 220 pounds he'd be a big target for his fellow infielders. 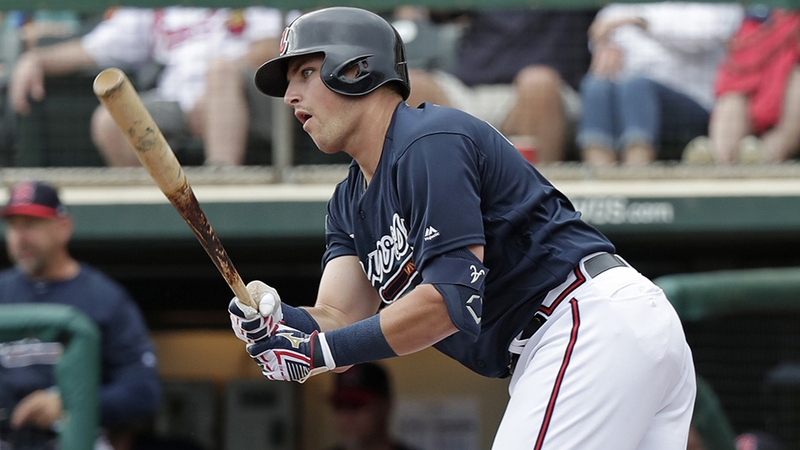 Major League manager Brian Snitker gave the 2015 41st overall pick the heads up a couple weeks ago, and he got his first official playing time at the position Sunday. He didn't commit an error and was tasked with making solo plays in the fifth inning on an unassisted groundout by Pedro Alvarez and in the seventh on a foul popout by Jon Berti. "It was good," Riley said of his first-base debut. "I actually felt really comfortable. I got to make some plays and stuff like that. After the first couple pitches I felt really comfortable. ... I would say seeing a different view than third base. The ball's coming off a little bit different. That's probably the biggest thing. But I've felt fine, so it's not too bad." There's still one thing at first base that needs to get a little bit more comfortable though -- Riley's glove. "It's actually not broken in yet, so I had to borrow someone else's," he joked. "But I do have one, so I am available for sure." The reason for all the movement defensively has little to do with Riley's leather. The right-handed slugger's bat has been impressive throughout his Minor League career, including a 2018 campaign in which he hit .282/.346/.464 with 12 homers in 75 games at Gwinnett. His 19 homers across all levels ranked second among Braves farmhands and marked the third straight season he's hit at least that number. Any team would love to make the most of Riley's offensive potential, even one that already boasts Donaldson and MVP contender Freddie Freeman at the corners. Riley wants to make that happen as well. He saw fellow Top-100 prospects and Stripers teammates Mike Soroka, Kyle Wright, Touki Toussaint and Bryse Wilson crack the Majors in 2018 and was in the building at SunTrust Park for Kolby Allard's debut on July 31. With the NL East expected to be wide open this summer, the Braves will need every ounce of talent they can get to repeat in the division, and Riley's bat is a potent asset. Which Mizuno glove he needs to wear to make that happen is immaterial to him. "It's very easy," Riley said. "The ultimate goal is to get to the big leagues. If that's playing first, playing the outfield, being a bench role, I'm going to do whatever it takes because we are in the hunt for a championship, and I think we're really close. If I can be a part of that, it'd be huge."